Email plays a large role in today’s business culture. 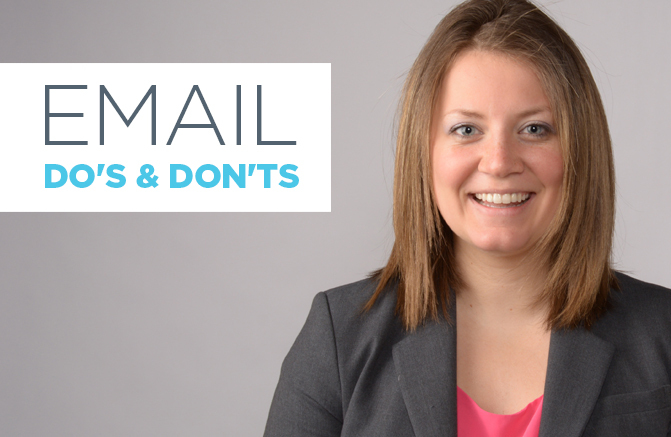 Check out these tips for proper email etiquette now that you’ve entered the world of professional communication. Nobody wants to read through a novel-length email. Do your best to be concise and descriptive. If your email is turning out to be too long, consider formatting the information into a Word attachment. Generally, it is easier for someone to print out a Word document or skim it on their screen than to attempt reading an extremely lengthy email. At a new place of employment, if they have given you an email, be sure to make a signature! Don’t forget that everyone sees your signature. Make it professional and informative. Include your name, position, phone numbers and email. Don’t be afraid to reference someone else‘s signature for format when creating your own. Let’s say someone has emailed you thinking that you were the right person to contact. However, it turns out that you are not the correct person to handle their request. Instead of responding back asking them to email so and so, copy the correct person into the reply email. Say “hello” to the newly cc’d person and inform them of the request. This courtesy email will save everyone time and effort. Keep communication efficient for you and whoever you are emailing. We get it…you’re excited! However, try to keep your exclamation marks to minimum, not using them in the initial email you send. Your first email to a co-worker or boss should always be professional. Following this initial email, use your judgement for further conversation. It can be helpful to mirror how someone responds to you. For example, if they incorporate smiley faces or extra exclamation marks, then by all means feel free to do the same. When you are communicating with someone else or a group of people, don’t be nervous about repeating yourself when it comes to getting a task done. Extra clarification helps keep everyone on top of their assignments. As emails can get long, lost and confusing, we all need a little reminder here and there. Saying “Thank you for filing out the report,” is better than just saying, “Thanks.” Of course, not all circumstances require you to provide extra information. Either way, always be sure you are including the appropriate amount of detail within your emails. The best thing you can do is observe how fellow employees within your company communicate. You will learn best by understanding how your company culture works. Every organization is different and appropriate communication is important! Be observant. Be mindful. Be professional.